Oceanic wave power is a technology that converts the oceans waves into electricity by placing specially designed equipment in the oceans to capture the movement of the waves and convert it into power. There are many different types of technologies that harvest electric power from the dynamics of wave movements, but the operating principles of these technologies are all based on an oscillating movement of the sea water. We know from this alternative energy website how wave energy devices work and that wave power devices utilise the continuous up an down wave movement on the oceans surface which is caused by the effects of the sun and the wind transferring energy as they move. But as well as this up and down movement of the waves along the surface of the water, we can also see that the oceans surface is covered with waves of various shapes and sizes. The vast majority of ocean waves are created by the wind moving over the waters surface. The action of the wind across the waters surface causes ripples to appear that grow and develop into waves, and if sustained into larger swells as it transfers more of its energy. But ocean waves can also be created from non solar activities such as landslides, earthquakes, underwater eruptions and boats etc, especially large vessels. The sea level of the water out in the large oceans rise and fall according to a predictable patterns every 24 hours. The change in water height between successive high and low tides is called the range which can vary from a few centimetres out in the vast open oceans to many metres at particular coastal sites. Smaller deep water waves is the movements of waves out in the open ocean while the larger shallow water waves are those types of waves that move closer to the shoreline eventually crashing onto the beach. The tidal movement of the Earth’s oceans (called an ocean current) follows a regular pattern and takes the form of a certain type of water movement called a “tidal wave” and as such, this movement is an indirect use of solar energy. But a tidal wave does not just affect the surface of the seas and oceans but instead the whole column of water from its surface to the sea bed moves along at the same velocity as the tidal wave due to the rise and fall of the oceans. The possibility of using these deep water waves for generating electrical power has been known for many years, and as such there are countless different floating machines and ideas to extract the kinetic energy from the movements of waves and convert each wave movement into free electricity using a generator with devices ranging from oscillating buoys to ducks to snakes and to enclosed chambers. These floating wave energy devices are normally anchored to the ocean floor by means of steel (or concrete) supporting legs in shallow waters and by a flexible connection (usually a chain) at great water depths. The challenge when using these types of supports is posed by the dynamic and static forces acting on the supports or chains due to wave movements. To produce any useful electricity, the relatively slow up and down oscillation of the tides and movements of waves have to be transformed into a single mechanical output that can be used to rotate an electrical generator at hundreds of rpm, which in itself will require some form of gearing mechanism. Note that waves can be formed by the merging together of several waves each with different wave heights, wavelengths and speeds, and as a result, the visual appearance and movement of a particular wave will be more irregular than that of the simple sinusoidal wave above. 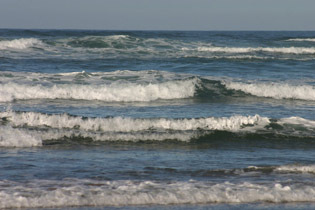 We know from our science classes at school that the oceanic tides and currents flow around the worlds oceans as a result of the effects of the gravitational forces of the sun and the moon on the planet and that we can use the kinetic energy of this ebbing and flowing of the tides either directly or by trapping water inside tidal barrages to drive hydro turbines. But waves do not move or transport water around the oceans, instead waves move energy. While it appears that waves move in a forward direction across the surface of the water, the sea water stays more or less in the same place passing its energy along the line. Think of it this way, in a football stadium the crowd perform what is generally called a “Mexican Wave” in which the people stand up and then sit down in sequence. Their appearance, from a far is that a wave of people are moving around the stadium when in fact all they are doing is standing up and sitting down within the same physical location, and the same is true for ocean waves. The movements of waves is not a horizontal movement across the sea, but a cyclic up and down vertical motion. But what about surfers, why do surfers move along the waves if the movement of waves does not move water. This is because the surfers are powered or propelled by the energy travelling along in the waves, because as stated above, waves transport energy not water. As the movement of the wave approaches the shoreline, the depth becomes shallower causing the wave to slow down but increase in height as the volume of water behind pushes it along. The wave then becomes to tall to support itself and the front of the wave breaks or collapses (which is the bit the surfers use) loosing energy and speed as it travels towards the coastline. The movement of waves can pass through the vast open waters of the oceans for hundreds or thousands of kilometres with little or no energy loss before moving into shallower water to release its energy as it hurdles tons of water towards the coastline. The force of this wave power can be so great that it eventually washes away the coastline causing erosion. Waves store energy as both potential energy within the mass and volume of water displaced from the calm sea level, and kinetic energy in the up and down motion of the water itself. The amount of renewable energy transferred, and hence the movement of the resulting wave depends on the wind speed. Then the height and length of these ocean waves in deep water depends on the duration and speed of the wind blowing over the surface water. In fact, the largest and most powerful waves are generally caused by the trade winds that blow strongly in the same direction across open oceans. Thus the worlds oceans and seas can be viewed as being a vast collector of wind energy as it blows for long durations over the unobstructed expanses of ocean releasing this stored energy in shallow water. Then two factors affect the movements of waves and are wind strength and uninterrupted distance over the oceans surface that the wind can blow. We have seen that ocean waves are generated by the action of winds blowing over water and which can be used as a renewable source of energy. Waves offer tremendous amounts of stored energy, but the energy available as a result of the movements of waves is inconsistent compared to other forms of oceanic energy systems. Wave energy potential, like most forms of renewables, also varies from place to place depending upon its geographic location with increased wave activity found upper on lower areas of the hemispheres, induced by the prevailing western winds (westerlies) blowing in these regions. At the moment, the movements of waves are able to power navigational buoy lamp using the up and down motion of a buoy tethered to the ocean floor to rotate a generator, creating electricity. However, as wave power levels change, from wave to wave or hours to days in response to local wind conditions or from the arrival of a swell from distant storms, the output of any wave energy device will need to follow the profile and movements of the waves to generate more than just small amounts of power. To learn more about the movements of waves, or if you just want to explore the advantages and disadvantages of how wave energy works, then Click Here to get your copy of one of the top books on ocean surface waves direct from Amazon today and learn how the atmosphere and ocean combine to produce the perfect waves. What do you know about the waterotor wave and water technology? – this used to be the case, but today it is posible to use permanent magent generators that run without gearing. Hello Bjorn, Both permanent magnet generators and generators with electromagnets can be used for the conversion of the mechanical power into DC electrical power which is then converted to AC. These low speed DC generators using rare−earth cobalt or neodynamium compounds and electromagnet stabilisers can be expensive. A cheaper permanent-magnet alternator or an AC synchronous or AC induction generator are more cost effective and can be directly coupled through a gearbox or belted to increase their rotational speed.